68 MMS March 2017 mmsonline.com FEATURE 80 percent of their parts might benefit from being remade this way. 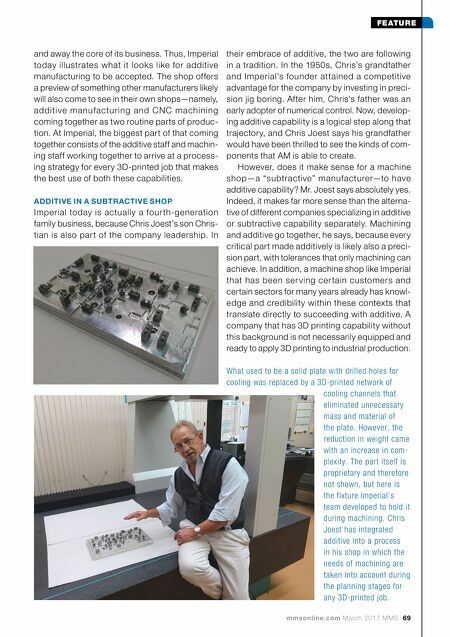 Soon af ter Imperial installed its f irst SLM machine, I wrote about the company for our sister publication, Additive Manufacturing. The title of that article was "Learning Curve," a phrase describ- ing the state of the shop's embrace of additive then. In the time since, the shop purchased its s e c o n d ad d i ti ve m ac h i n e a n d i t h a s l a rg e l y ascended at least the steepest part of that curve. Additive work now represents 5 percent of the company's sales, meaning the activity commands a large-enough share of revenue to be noticed and accepted, even though machining is still far Here is additive manufac- turing in action. 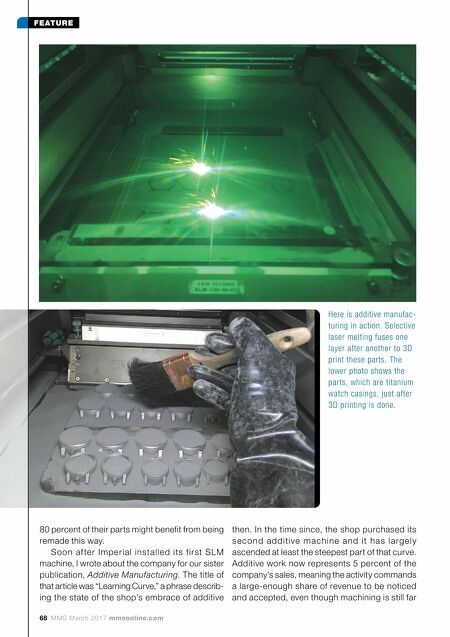 Selective laser melting fuses one layer after another to 3D print these parts. The lower photo shows the parts, which are titanium watch casings, just after 3D printing is done.